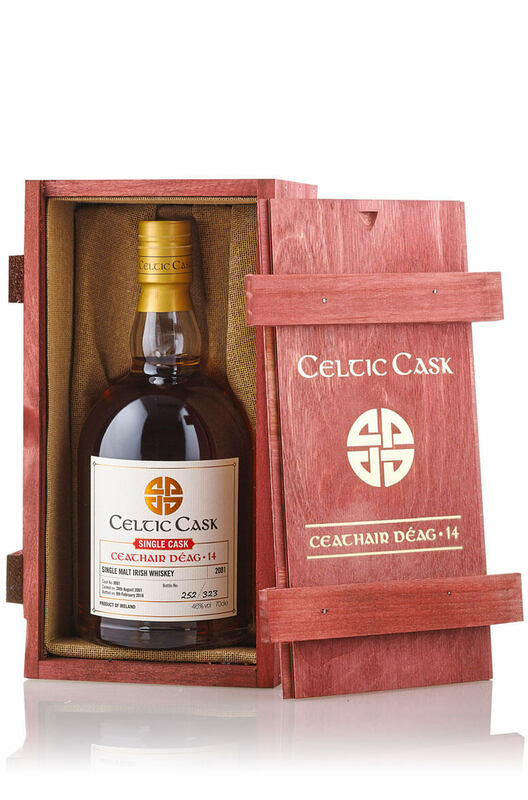 Celtic Cask Ceathair Deag is our fourteenth special release in our line of exclusive whiskeys. This time we sourced a double-distilled unpeated malt whiskey from a well known distillery. It was initially matured for 11 years in a first-fill bourbon cask before being transferred into a special wine cask. A final maturation period of over 3 years took place in a top quality wine barrel from the Altesino estate. Brunello di Montalcino is one of Italy's most sought after red wines and this barrel was previously used to mature one of Altesino's top cuvees of Brunello. Only 323 bottles were produced and they will not last long! Nose Salted caramel, banoffee pie, pineapple, red apples, cookie dough and citrus peel. Palate Thick and rich with dried fruits, mocha, orange peel, malt and spice flavours. Finish Long, fruity and spicy. Types of Barrel used for Aging Initially aged in a bourbon barrel before being finished in a Brunello di Montalcino red wine cask from Altesino.